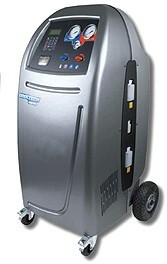 Car air conditioning - mobile service and repair covering the Kent area. Have You Got COLD Air? Our new fully automatic, state of the art car air conditioning machine. answer any of the questions you may have about car air conditioning. If having read the following information about car air conditioning, gives you an idea that you are going to need your vehicles air conditioning system looked at, please gives a call today to arrange an appointement for us to check and service your car’s air conditioning. How long does the refrigerant last? there anything else that needs doing? How do I know when I need a top-up? What is the best way to run my AC? info and advantages of Car Air Conditioning. Because the UK has a temperate climate many people have assumed that air-conditioning in their car would be a rarely used luxury that was not worth paying for. Now that we have experienced several relatively warm years the benefits of air-conditioning are gradually being generally accepted. and car air conditioning is now fitted as standard to many cars , its not just a luxury item any more. are not immediately obvious are now being appreciated by those fortunate to have a good system operating in their car. in-car temperature to a comfortable level on exceedingly hot days, without having a seventy mile an hour gale buffeting you and being unable to hear the radio or your passengers because of the wind-noise. If you have youngish children you will quickly appreciate the extra quiet in the back – aircon seems to almost magically remove the bad temper from most children. As aircon also conditions the air, the ability to remove the moisture from the air coming into the car on really muggy days and to achieve a comfortable atmosphere within the car, perhaps in conjunction with the heater control . the AC button will control the Relative Humidity and the heater if needed will control the temperature leaving you free to enjoy the warmth without being stuffy. Very few cars are not able to utilise this extremely useful facility. The ability to be able to see through the windscreen and all the other glass clearly without a film of mist. The safety aspect of aircon is often overlooked but is extremely important particularly to the mini people carriers which are becoming so popular now. heater has had a chance to warm up and will continue this advantage around the side glasses and on to the rear screen. For best effect use the AC button, perhaps in conjunction with the heater in winter and on the fresh air setting (not recirculation). The cleaner, fresher air with low Relative Humidity will enhance driver awareness and help prevent drowsiness making your journeys and those of your loved ones safer over long distances as drivers are better able to remain fresh and alert. coming straight into your open windows, particularly if you are dressed for business – wet under the arms and hot under the collar- probably the time when you most wished that you had bought a car with aircon. This is when AC proves it is one of the nicest affordable luxuries. All the air coming into a car with aircon passes through a heat-exchanger, which as it is very cold, quickly becomes dripping with condensation, which collects and drains out under the car. dripped back onto the road. It is estimated that approximately 80% of all dust and pollen is trapped in this way on each pass through the evaporator – this helps us all but is a source of particular relief to Hay Fever sufferers or Asthmatics. to remain closed, even on the hottest days, the aerodynamics of the car remain at optimum, keeping fuel consumption low and exterior noise to a minimum, increasing safety to the driver and passengers. compresses it to quite a high pressure. This pressure can vary a lot but typically in summer would be around 250 psi. Gas compressed this much heats up considerably. This hot, high-pressure gas leaving the compressor is piped to the front of the car where it is connected to a radiator capable of containing these high pressures. As cool air passes through the radiator it cools the gas sufficiently to turn it into a liquid in exactly the same way that if steam is cooled it turns back into water. So now the refrigerant is in liquid form coming out of the pipe from the bottom of this radiator (still at high pressure remember) and it is piped back towards the evaporator where there is a restriction in the pipe like a pin hole where it is squirted in a fine spray into the evaporator. This high-pressure liquid spray now finds itself in an area of very low pressure (remember this is where we came in – it is the area that the compressor is sucking). It now has the room to expand and turn back into a gas, and it longs to do this, but to turn back into a gas it has to absorb some heat (stretch your mind back to school-days, ‘Latent Heat of Vaporisation and all that’, is it coming back to you?). It finds the heat necessary to return to a gas by stealing some of the heat from the car’s interior – it takes what it needs and leaves you with just a little heat – perhaps five degrees Celsius. Aha – this is just what you want. You feelnaturally that the AC is giving off cold, but what is really happening is that it is taking your heat away and leaving you with a lack of heat – which is of course what we call coldness. There are one or two niceties about the system that we don’t need to go into here but that basically is the whole system, with the gas being compressed, condensed into liquid and returned to a gas in a continuous cycle. It is the change of state from liquid to gas which achieves the cooling, and if for any reason there is insufficient air passing through the front radiator (the condenser) then the gas will remain as a hot, high-pressure gas and will complete the circuit back to the compressor still as a gas and there will be no cooling. viscous coupled or clutch operated. They may be perfectly adequate to keep the engine cool but the extra task of coping with the AC may sort the sheep from the goats. need replacement, as they may no longer be capable of shifting the quantity of air they did in their younger days. An electro fan that may not have had to do any work for six months because the refrigerant has run down and has not been recharged for a time may easily seize up and refuse to work again (particularly common with Ford Scorpios and BMW’s). refrigerant in the system to not damage the compressor and assuming that there is, it allows 12 volts to flow to an electro-magnetic clutch on the compressor. by the electro-magnet and the compressor starts to turn at the same speed as the belt pulley. Within 15 seconds some cooling can be felt but it may take a minute or so to achieve the lowest temperatures. It is normal for the system to have other sensors to monitor for excessively high pressures (over about 450 psi) and to turn off the compressor to avoid the possibility of damage, and also another to turn on or to increase speed of anelectro fan when pressures rise to about 275 psi – this fan will quickly reduce this pressure. The temperature of the evaporator is usually maintained at just over freezing point either by a thermostat or by a switch or a valve that controls the pressure and thence the temperature. illustration but some slight differences may be obvious in your own vehicle. For example many of the earlier systems used the GM Axial 6 cylinder compressor utilising a strange looking 3 legged fuse, this system does not check for sufficient refrigerant pressure as stated in the paragraph above, but will deliberately blow the fuse if the compressor detects that it would be damaged by an insufficient refrigerant charge – Jaguars were the most frequent users in the UK. Climate Control is a more sophisticated control of temperature to what ever is required by the driver or even the passenger independently. the passenger may prefer 21º C.
degrees to compensate for the extra warming of the sunshine through the glass. Several sensors monitor other factors and compensate as necessary. Climate Control does sound really the bee’s knees and nothing else should be considered. In practice however even the simplest system of AC can work so efficiently that it does make you wonder why anyone should go to the trouble of the complexity of climate control. After a little use it is very easy by adjusting fan speeds and face-level-vent apertures to achieve very acceptable comfort from a very simple system. My own car at present (VW T5 Van) has a very basic system but is capable of making me very comfortably indeed. difficulty emulating some of the characteristics of Climate Control with just plain old AC. coming in is too cold for comfort, you could try turning the AC completely off. need to turn the AC on again. for you if you have this. Does the AC use more petrol? The short answer is – yes it does. example if you get in your car and drive up the motorway for a hundred miles at seventy miles an hour the amount of extra petrol or diesel used to run the AC is negligible. Indeed if you were to turn the AC off and drive instead with a window open to keep cool, you may well find that the increased drag on the car would increase the fuel consumption more than by using the AC button. to pay in petrol for the comfort of continuous AC. For example you get into a stinking hot car and drive 15 minutes to the supermarket. By the time you get there the car is comfortably cool and you leave it in the full sun for an hour while you do the shop. After the hour the car has returned to its stinking hot have to have the AC on full again for the short journey home. journeys then the fuel consumption is definitely going to deteriorate but after all you get comfort in exchange. For a few minutes each day the compressor is going flat out, taking power from the engine and in addition both the internal blowers and the electric condenser fans are working hard to cool the car down, causing the alternator to work hard to power them and loading the engine further. If this same car is then used for a long journey, after perhaps ten minutes once the internal temperature is reduced comfortably, the AC throttles itself back – its done the hard work, now it only has to keep the car cool and now the fuel consumption returns to a much more acceptable level. Similarly if on a hot day you drive along and perhaps note that the fuel consumption on your onboard computer shows 34mpg and you turn on the AC and it immediately drops to 28 mpg it would be easy to assume that you were loosing 6 mpg for the AC. Having read the previous few sentences you can now work out that this simplistic assumption is not in fact correct and that within a few minutes the computer will show a gradual rise to near the point at which it started. this relatively low speed the effects of an open window are nothing like so serious as at 70 mph, but even so the effect on fuel consumption was an increase of 7% – quite a considerable increase for this moderate speed. With the windows closed and with the AC on, to quote the official report – “the consolidated data suggest that air conditioning has a minimal affect on fuel consumption”. refrigerant of the same family of CFC’s, the use of it world-wide was huge. Every fridge we the general public scrapped would have been broken up by the rag-and-bone man to recover the steel and copper and the R12 allowed to escape. refrigerant with no possible contamination. thought to be safer! When a refrigeration or an AC system develops a fault the refrigerant is recovered and recycled – we have moved on. R12 is now only used for the AC in cars built before 1993 but it is not completely dead and buried however – although no longer used in car AC systems it is still widely used by Medicine and also by the Military (among other things it is used to cool the warhead in missiles I believe). R134a and saves using a name that is about as long as a certain Welsh railway station. There should be a sticker in the engine bay telling you if you have R134a. flame-throwers could learn a thing or two from this). Both R12 and R134a are not flammable. Although R12 is no longer fitted into new cars those built before about 1993 will still need to be recharged with it say every three years. lower pressures to achieve the same result and thus creates fewer greenhouse gases than R134a. provides a better seal on the compressor shaft I believe. However although R12 systems lose their charge more slowly than R134a systems this is offset by the fact that is more important for R12 systems not have a low charge as if moisture enters the system (as it can with a low charge) this will mix with R12 to create acids within the system which will do no good at all and will start to corrode the system from the inside. A good rule of thumb would be to recharge a new car after no more than four years and then to recharge at three-year intervals. Most problems occur when the system is struggling because it has insufficient gas to do it’s job properly, and some of the results can be expensive to put right. It’s usually much cheaper to maintain it regularly every three years than to wait for a breakdown and possibly an expensive repair. Particularly do not leave a car with a low charge over the winter months – this is when the air contains most moisture in it and it is likely to enter the system. Get it sorted when you first notice it and you will still have a system next spring – leave it and you take a big risk. This is usually where I come in and at this point I start asking questions. Many of the answers I would really like to know as they may require specialist knowledge but there are some questions you could ask yourself and make some judgements upon. was last charged? If you have owned the car for less than about two years and have no other evidence then look further. 2. Is there enough air coming through the face-level-vents? Turn the blower right up, put the air control to face-level and feel how much air is coming out, insufficient could be the result of blocked pollen/dust filters if you have them or a dislodged piece of air trunking under the dash or a vent control that has stuck or even a blower motor not pulling it’s weight. Try pushing the recirculation button (your handbook will show you the logo for this) – if more air comes out of the face-level vents then suspect the pollen filters. where the drive belt is running and get a friend to switch the AC on and off a few times, not too quickly as some systems do not start for several seconds after the switch has been pushed. You should hear a distinct click as the clutch operates and you may then be able to identify which is the compressor, you should then be able to observe that when the AC is turned off the belt turns the pulley only but when it is switched on, the outer plate (which is connected to the compressor internals) turns also. If it does not turn, look first at the fuses – it could be something really simple. Should an AC fuse have blown, before you replace it, check that any electro fan on the radiator is able to turn freely – if it is stiff it may draw excessive current and blow the fuse again. If no fuse has blown probably the most likely scenario is that the gas pressure is so low that the safety switch has operated to prevent the compressor turning and risking damage. Double-check that the blower is actually running – if this fails the AC will not run. Early systems using the large black cylindrical Harrison or Frigidaire A6 compressor (mostly Jaguars and Rolls in the UK) frequently used a strange three-legged fuse mounted on the front end of the compressor, under adverse conditions this blows to protect the compressor and to ensure that the system is looked at and preferably recharged before the fuse is replaced – this is one fuse that almost certainly means that a recharge is necessary, don’t be tempted to just replace the fuse without having the system checked out first. Vauxhalls and Volvos do not have a sight-glass as most of them use a slightly different system, as do some recent Fords. until the AC is actually switched on then you probably do need a new compressor although it is worth looking to see if the car has a belt tensioner idler pulley as that might just be the source of the noise. It is also worth saying that my twenty year old Mercedes has a noisy compressor – I’ve added a little too much oil and I turn the radio up a little but the AC works fine and it doesn’t leak. If you have (A) above, you could be lucky; the problem is almost certainly a failed compressor pulley bearing – a fairly common fault. As long as you act quickly you could repair this for the price of a new bearing (between £10 and £40), frequently without even having to recover the refrigerant. If you have (B) above you may also be lucky like in (A) but there is a risk that the main support bearing within the compressor has also been damaged – this would require a rebuilt compressor. If you have (C) you probably do need another compressor. occasional recharging but is there anything else that needs doing? a container, which has a bag of desiccant in it to absorb any free moisture. like an oil filter but perhaps not so frequently. the vents but the expansion valve glowing with hoar frost. usual, I do not know about this at present. result can be achieved by following this. marked as Max on some models). whichever you choose to do, or perhaps both. and come down in the rear of the car. demist the car the technique is quite different. AC will be far quicker. this, I will go into it a little. car. Having AC fitted later can be a bit of a shock. Range Rovers although probably not under Japanese influence. passengers knees, where it is relatively easy to access. very lengthy and expensive task, possibly up to two days work. loom for AC installed in all models, whether actually fitted with AC or not. thus cheaper it will be to retrofit. Equipment. Prices would range from about £1000 up. to the wall. Prices probably from £850. the AC is functioning correctly or at least is still charged with refrigerant. that it is time to recharge the system let’s stop and consider the options. The AC is hardly working with little cooling or has stopped completely. my exhortations in the paragraphs above about 3 yearly recharges and hang on to the remainder of the R12 that you have. The alternatives are not as good as R12 so wait until the system is noticeably not cooling as it should and then go on to number 2.
replacing with more modern hoses. in size and configuration and can fit directly on to the car. the extent and type of the change are beyond the scope of this article. as the charge gets low than it was with R12. look, there goes another herd of pigs flying past. more than a little credit. north Kent then please contact them here .